Today a very special group of wifies are meeting up for the weekend, and I cant be with them. Again. I've had my little sob and my little footstamping "snot fair". Now I just want to tell them how much I miss them and how much I wish me and Moo could be with them. I am of course talking about my Brit Bee chums. I have another reason for this post though, and that is to thank them. 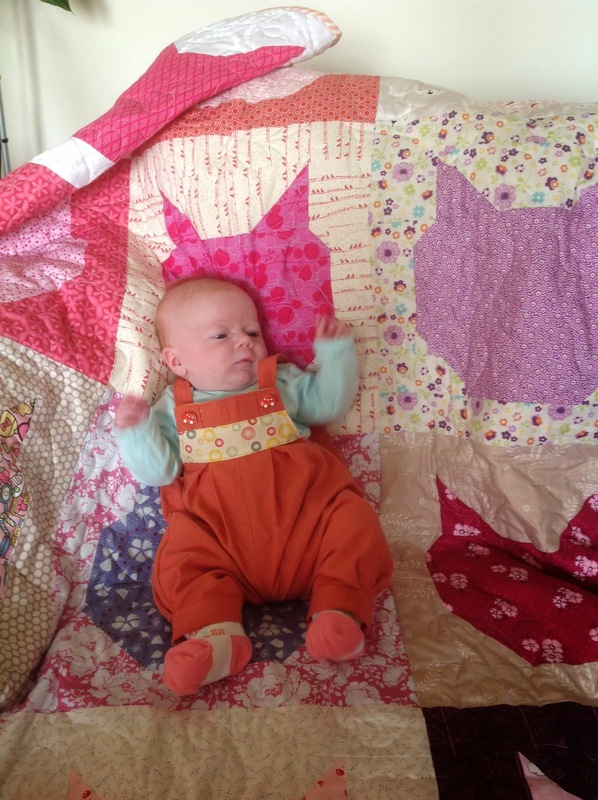 Little Molly Moo received her very own brit bee quilt! And so very perfect, every last detail. I LOVE the block. The fabrics are all beeeeeautiful. 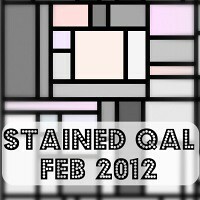 The quilting is gorgeous loopy lovehearts. And I love a stripey binding. And the backing just couldnt be better. It says everything. See how excited she is?! Unfortunately she's still a month or two away from photogenic smiles or holding herself up or still....But hey, awake, no bottle and not screaming! We'll get there though, and this quilt will be with her all her life, so there will be plenty more pics to come. Thank you ladies, sending MASSIVE Moo cuddles to you all. Oh I am so glad you love it (It's Aneela's Meow pattern). Moo looks most content, just get her to hold that thought! That quilt is fab! Moo looks like she's growing fast and I love that she's wearing your mum's dungas - very cute. Awwww, she's so cute! And growing so fast! The quilt is lovely - have fun naming all the kitties! Hello there, little Molly Moo, how you've grown already. Fab quilt, the Brit Bee chums are great friends. she is gorgeous and Brit Bee did an amazing job! She is growing, and the quilt is fantastic. Ahh, not sure which is cutest, Molly or the kitties ! Look gorgeous ... Both of them! So sweet, quilt and baby both! Awwww she is completely adorable! my my I could fall in love with Molly so easily; she's a star. And Hello, Kitties, what a thoughtful and sweet gift for the young lady. My 15-month old climbed aboard my lap today and sewed two seams with me; scary to think how quickly he has grown. Hi, Sarah. Well! I haven't been by for quite awhile and here things have really changed for you!. Many congratulations for Molly. What a lovely baby, and no they don't stop being angry until about the age of 40 (if you're lucky). But it's all worth it anyway.